Serial spectral domain optical coherence tomography (SD-OCT) images can be applied to monitor the effectiveness of systemic treatment in choroidal metastasis. Besides, it can be used as a guide to shifting to alternate therapy in nonresponding cases. SD-OCT was performed in a patient of primary adenocarcinoma of the lung with choroidal metastasis in the right eye. SD-OCT revealed neurosensory detachment overlying metastasis and involving macula. The patient was started on chemotherapy and external beam radiotherapy. After treatment completion, neurosensory detachment resolved completely with the regaining of normal foveal contour and improvement in visual acuity. Choroid possesses a highly vascularized network of choriocapillaries forming a thin sheet. Blood velocity in the choroid is slower than that of the retina, making choroid a potential site for metastasis. Choroidal metastasis is the most frequent ocular tumor., In choroidal metastasis, primary tumors are located more frequently in the lungs or breasts. Spectral domain optical coherence tomography (SD-OCT) allows us to image different layers of the retina without histological examination. Although SD-OCT is not the primary diagnostic modality for choroidal metastasis, optical coherence tomography (OCT) features have been described for the same. There are associated retinal changes observed on histopathological examination in choroidal metastasis. SD-OCT might be useful in tracking these changes associated with choroidal metastasis. We present a case of the right eye choroidal metastasis with serial follow-up on SD-OCT.
A 64-year-old-male was referred to our hospital for ophthalmic evaluation of complaints about the diminution of vision of the right eye for one month. He was a known case of biopsy-proven adenocarcinoma of the lung. The patient underwent thorough ophthalmic evaluation. His visual acuity on Snellen's visual acuity chart was finger counting at ½ m in the right eye, not improving with pinhole, and 6/6 in the left eye. His slit lamp evaluation did not reveal any remarkable alteration. Intraocular pressure in both eyes was 13 mmHg. 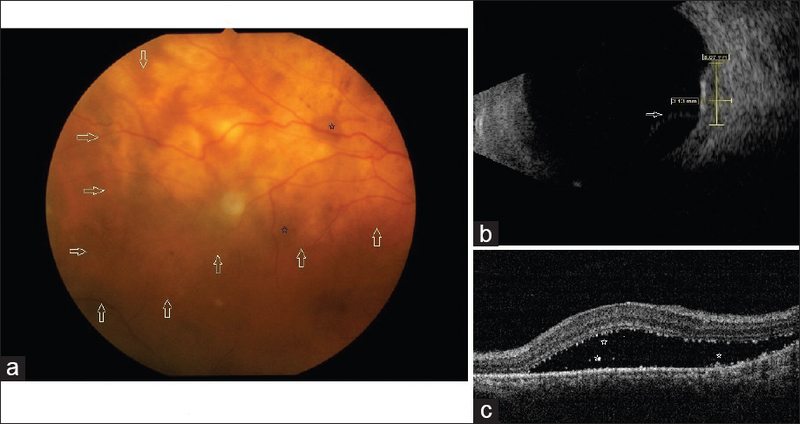 Fundus examination of the right eye showed multiple cream-colored yellow subretinal elevated round lesions in the superotemporal quadrant involving posterior pole and macula. There was associated exudative retinal detachment [Figure 1]a. Ultrasound of the right eye showed diffuse choroidal mass lesion in the superotemporal quadrant of high surface reflectivity and moderate-to-high internal reflectivity. Choroidal thickness was 3.13 mm. The base diameter was 8.07 mm. There was associated overlying exudative retinal detachment [Figure 1]b. His left eye fundus evaluation did not reveal any remarkable alterations. SD-OCT of the right eye, through the macula, demonstrated neurosensory detachment, multiple hyperreflective dots lesions along the outer margin of the retina, in the subretinal space, and along the inner margin of retinal pigment epithelium (RPE)-choriocapillary complex. Central foveal thickness (CFT) was 611 μ [Figure 1]c.
Thus, the diagnosis of choroidal metastasis secondary to adenocarcinoma of the lung was made. After receiving one cycle of palliative chemotherapy with etoposide and cisplatin based combination regimen, the right eye showed no marked improvement in visual acuity while fundoscopy showed a marginal reduction in the size of choroidal lesions and exudative retinal detachment [Figure 2]a. SD-OCT showed a decrease in neurosensory detachment but the persistence of hyperreflective dot echoes along the outer margin of the retina and along the inner margin of RPE-choriocapillary complex. CFT reduced to 493 μ [Figure 2]b. The patient received three more chemotherapy cycles with the same etoposide and cisplatin regimen. Due to systemic toxicity, the palliative chemotherapy schedule changed to carboplatin and pemetrexed based regimen and the patient received four cycles of carboplatin and pemetrexed based palliative chemotherapy. His visual acuity improved to 6/24 in the right eye. On fundus evaluation of the right eye, the choroidal lesions had flattened with a resolution of exudative retinal detachment [Figure 3]a. SD-OCT at this time showed resolution of neurosensory detachment, disappearance of hyperreflective lesions and regaining of a normal foveal contour with CFT 191 μ [Figure 3]b. Features of choroidal metastasis on OCT have been described as dome-shaped elevation of the retina, hyperreflective points in the neurosensory retina (corresponding to retinal compromise by cancer cells), a double hyperreflective band at the RPE-choriocapillary complex, shadowing in some parts of the RPE-choriocapillary complex, increased thickness of the RPE-choriocapillary complex, areas of no reflectance within the neurosensory retina, suggestive of splitting of intraretinal layers. The presence of neurosensory detachment and the presence of hyperreflective dot-like deposits in subretinal space, beneath the retinal surface, and above RPE-choriocapillary complex are characteristic features observed on SD-OCT in our case. Nevertheless, we did not observe intraretinal splitting as observed by others. As chemotherapy cycles progressed, neurosensory detachment regressed and normal foveal contour was regained after seven cycles of chemotherapy. In our report, SD-OCT characteristics were matched with those described by other studies. Our case points out to the fact that OCT can be used as an effective tool to monitor response to chemotherapy in choroidal metastasis. In our particular case, the patient responded to chemotherapy. However, in unresponsive cases, nonresolving neurosensory detachment on SD-OCT could be utilized as a guideline for switching to alternative therapeutic modality in choroidal metastasis. Thus, SD-OCT, being a noninvasive and quick technique for evaluation of histological layers of the retina, can be used as a tool to monitor treatment response to choroidal metastasis. Duke JR, Walsh FB. Metastatic carcinoma to the retina. Am J Ophthalmol 1959;47:44-8. Koenig RP, Johnson DL, Monahan RH. Bronchogenic carcinoma with metastases to the retina. Am J Ophthalmol 1963;56:827-9. Barak A, Neudorfer M, Heilweil G, Merimsky O, Lowenstein A, Inbar M, et al. Decreased prevalence of asymptomatic choroidal metastasis in disseminated breast and lung cancer: Argument against screening. Br J Ophthalmol 2007;91:74-5. Hee MR, Izatt JA, Swanson EA, Huang D, Schuman JS, Lin CP, et al. Optical coherence tomography of the human retina. Arch Ophthalmol 1995;113:325-32. Al-Dahmash SA, Shields CL, Kaliki S, Johnson T, Shields JA. Enhanced depth imaging optical coherence tomography of choroidal metastasis in 14 eyes. Retina 2014;34:1588-93. Shields JA, Shields CL. In: Intraocular Tumors. An Atlas and Textbook. 2nd ed. Philadelphia, PA: Lippincott Williams and Wilkins; Metastatic Tumors to the Uvea, Retina, and Optic Disc; 2008. p. 198-227. Shields CL, Shields JA, Gross NE, Schwartz GP, Lally SE. Survey of 520 eyes with uveal metastases. Ophthalmology 1997;104:1265-76. Schaudig U, Hassenstein A, Bernd A, Walter A, Richard G. Limitations of imaging choroidal tumors in vivo by optical coherence tomography. Graefes Arch Clin Exp Ophthalmol 1998;236:588-92. Arevalo JF, Fernandez CF, Garcia RA. Optical coherence tomography characteristics of choroidal metastasis. Ophthalmology 2005;112:1612-9.